Nail fungus can affect fingers or toe nails. There is a huge and growing number of people who need Onychomycosis treatment, given its widespread nature, there is relatively little public awareness of the disease and the treatment options, with many people not even knowing that they have fungal toenails because it’s normally painless, and the symptoms may only be discolouration and thickening of the nail. Many patients find after trying anti-fungal nail paints they don’t work, and are even hesitant to take oral anti-fungal drugs because of long term commitment and the side effects (such as headache, nausea or diarrhoea). 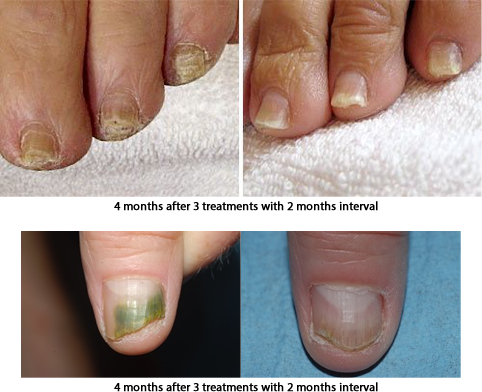 Caught early enough and treated, fungal toenails can be cured and normal healthy nail left to grow in it’s place, however in severe cases fungal infections can spread to other parts of the body and infected nails must be surgically removed. Ellipse Nd:YAG laser treatment offers a painfree, reliable and effective treatment, without the risk of uncomfortable side effects. Ellipse's Nd:YAG laser uses a "painting" technique to apply several shots per second, across the whole nail, cuticle and nail folds. A session typically lasts 10 minutes. No it is pain-free, Ellipse’s patented SoftCool® cooling system sends a continuous jet of cool air across the treatment area. This increases client comfort, while still allowing the nail-bed to reach the desired temperature. Both feet may take up to four treatments which ensures the best chance of success. Why have Ellipse Laser Treatments at Aura Beauty Clinic? We are a fully trained and authorised Ellipse treatment centre. We have specialist Ellipse therapists who are dedicated to providing personalised aesthetic treatments designed to address a wide range of skin care issues for the face and body. Their training, knowledge and expertise match their personal abilities and commitment to delivering safe and ethical treatments.